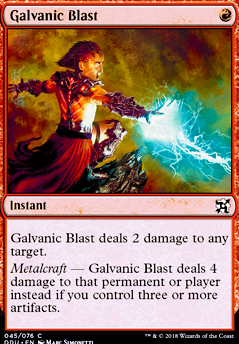 Galvanic Blast deals 2 damage to target creature, player or planeswalker. 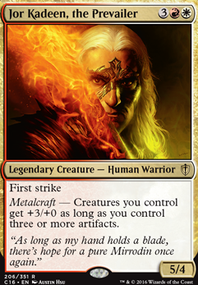 Metalcraft — Galvanic Blast deals 4 damage to that creature, player or planeswalker instead if you control three or more artifacts. The idea behind the deck is to use cheap artifacts to deal direct damage through Reckless Fireweaver , Galvanic Blast , and Shrapnel Blast . Kuldotha Rebirth doesn't really help with that. 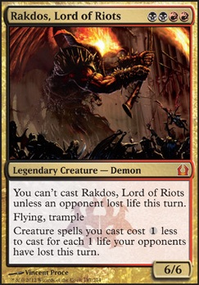 You could play a couple copies of Nettle Drone or Firebrand Archer if you wanted, but I've found that the four copies of Reckless Fireweaver are usually enough. Ideally, you want to spend turn 3 getting out a bunch of 0 or 1 mana artifacts, so that you can start burning on turns 4 and 5. Yeah but they need 16 slots (lands + expedition map) so i think is not worth unless u cast something very strong with that like “all is dust” or Karn. 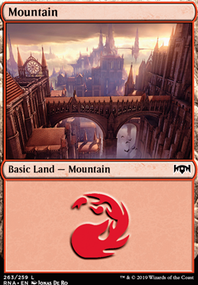 Instead u can put 12 colorless more useful lands or just splash some red for Galvanic Blast and Whipflare or white for Dispatch (even splashing blue could be useful for affinity cards to draw or counter). Hi! Thank you for your advice. I've really appreciete it. I'm gonna explain my choises. In my opinion the biggest problem with affinity (both the classical version and the monster version from Datenda) is that is slower than other aggros deck and too slow to really affect control player. Normally with the classical version I begin to be dengerous in the 4th-5th turn (when I’m able to play Gearseeker Serpent and more creatures on turn three). Too late. With this version normally I could cast a Somber Hoverguard on turn 3 having still some spell to protect him from counter or remuval and mana to cast them. Also play Gearseeker Serpent is easier. 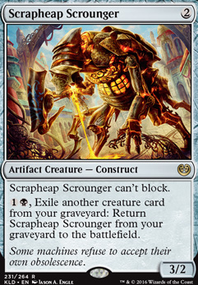 Moreover, equipping a Bone Saw on a Somber Hoverguard often means 4 flying damages (better than a Delver of Secrets Flip). That means put on your opponent a clock of 5 turns, instead of seven. You are right, when you say that this list seems not so agressive, but I wouldn't say that artifacts like Bone Saw are do-nothing artifact. 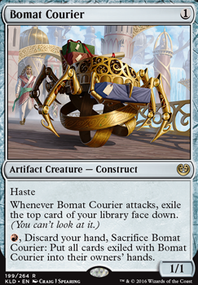 It gives this list a way to play its menaces faster, they help this menaces getting bigger, gives you (toghether with Artificer's Assistant the possibility to scry1 for free and a free way to discount Metallic Rebuke. I know, I'm going increadibly missing Atog, but I find it too predictable these days. When you know your opponent is playing affinity, you know that there is a possibility for a Atog + Fling , and in a meta dominated by blue it is not so problematic. So I'm finding it too risky for the current meta, at least in my lgs. You’re are also right when you find strange that Thoughtcast is missing. But in this version you need to know exactly what are you drawing in order to avoid dead draws in mid and late game. This is the reason why I prefer Preordain, Serum Visions and I use Artificer's Assistant. I’m considering to replace Executioner's Capsule with Galvanic Blast, but I fear that would be difficult adjust the mana base. Thank you again for your advice, let me know what you think.